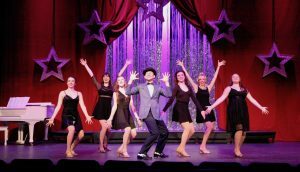 “Hits of Broadway,” a revue based on a wide variety of Broadway songs, offers a deep bench of wonderful melodies. Though not in a consistent chronological order, the show culminates in the latest Tony Award Best Musical winners. When you don’t have the through line of a plot, each song becomes its own world, inhabited solely by the performers involved. The strength of Music Mountain Theatre is its talent, energy and heart. With their own school and a junior program, it is grooming young people for the arts. This particular cast includes the juniors, some new performers from the community and some of the tried and true performers from the resident company. With a wide swath of experience, some efforts are better than others. But all are heartfelt and putting it out there for you. Jenna Parilla and Deborah Heagen got the audience smiling with their version “You Can’t Get a Man with a Gun” from “Annie Get Your Gun.” Younger performers from the junior program did a charming Rodgers and Hammerstein medley of “People Will Say We’re in Love” (Noah Conk and Bella DePaola), “I Have Dreamed” (Aidan Rice and Olivia Frankenbach) and “Ten Minutes Ago” (Ethan Rosen and Riley Kay Bultemeier). Jaime Geddes scored again with Jenna Parrilla, singing the ultimate duet from the musical “Side Show,” “Who Will Love Me as I Am.” Donald Hallcom gave a rousing version of “Strike Up the Band” from the Gershwin musical of the same name. Jenna Parilla gave a moving interpretation of “Omar Sharif” from the current Broadway musical “The Band’s Visit,” which won the Tony for Best Musical in 2018. But one of the best and most surprising moments came from Stuart Singer. He is the oldest member of the cast, and brings a depth of experience to Gershwin’s “Embraceable You.” He not only nailed the song, but also brought to it a level of yearning and pathos. It was moving and truly beautiful. The long audience applause was indicative of how duly appreciative of his talent they were. I want to go back just to see the last three again. They were that good. “Hits of Broadway” continues at Music Mountain Theatre through Sunday, Jan. 27, and tickets can be purchased online.